Warren writes, “God also planned where you’d be born and where you’d live for his purpose. Your race and nationality are no accident. God left no detail to chance. He planned it all for a purpose.” He uses Acts 17:26 (NIV) to support this statement. It should be obvious that the writer is speaking of nations, not individuals, as having their times and places set. There is absolutely nothing here to suggest that God plans where each of us will be born and where each one of us will live for his purpose. What purpose of God would it serve to be born into a disease infested ghetto in Calcutta. Yet millions are born and die there, never knowing about God and believing that cows are sacred. I could give many additional examples. People are relocating all the time and procreating as they go. To suggest that God is orchestrating all of this is pure nonsense. If I understand Warren correctly, he is saying that God planes every pregnancy. Really? Every time fornication or adultery is committed and the women get pregnant, God planned it. Sounds quite absurd. Let’s look at abortion. If it is a fulfillment of God’s plan ever time a women gets pregnant, and that women then has an abortion, that women is successfully thwarting God’s plan. I don’t think that is happening. I feel it is much more reasonable to believe that God has set the process of procreation in action, given man instruction as to how to facilitate that process, given man laws that govern that process and the freedom to choose to be in sync or out of sync with that process. Warren writes, “God never does anything accidentally, and he never makes mistakes.” I agree. But this doesn’t mean that God doesn’t allow us humans to do things accidentally and make mistakes. These human accidents and mistakes lead to all sorts of human problems including death. While I am sure that God is accomplishing an overall plan and purpose in allowing the creation to function as it does, I don’t see any reason to believe he is as active in our day-to-day lives as Warren suggests. I see life pretty much going along fortuitously with God intervening where necessary or in response to needs that we bring before him. CHAPTER 3: “WHAT DRIVES YOUR LIFE? 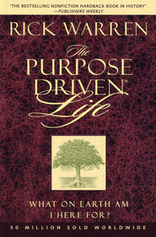 PAGE 30: Warren says, “Without God, life has no purpose and without purpose, life has no meaning. And without meaning life has no significance or hope.” Multiple thousands of purpose driven people would challenge him on the first part of that statement. Thousands of people who do not pay much attention to God are driven by purpose and therefore feel their life has meaning and significance. People dedicate their whole lives to various projects, causes, movements etc. and go to their graves feeling they have accomplished a purpose in life. I agree that a relationship with God should be the driving dynamic in a purpose driven life, but simple observation should tell you that people can and do create and sustain purpose in their lives apart from having a relationship with deity. Warren quotes Job 7:6 and 7:16 to demonstrate that life without God has no purpose, has no meaning and therefore has no significance or hope. Job 7:6, 16: When I lie down I think, `How long before I get up?' The night drags on, and I toss till dawn. I despise my life; I would not live forever. Let me alone; my days have no meaning. If you read Job carefully, you will see that Job had not abandoned God even though he was going through a great physical/spiritual trial. Job was not experiencing life without meaning because he was without God. Like many humans would be, Job was at a spiritual low because of what he was suffering. The statements he made about his days having no meaning were in the context of that spiritual low. Job wasn’t without God during this trial. He was simply humanly responding to his condition. We therefore see in Job a situation where life appears purposeless and meaningless within a context of having God in his life. This actually shows that even with God in your life, life can appear to be purposeless and meaningless. Therefore the scripture that Warren uses does not support his thesis that without God life is meaningless. In fact, in chapter 14, Warren shows that Job never abandoned God during his trial. Life can appear to have no purpose with or without God in your life. It all depends on the dynamics that make up your life at any given time. Page 34: Warren writes, “One day you will stand before God, and he will do an audit of your life, a final exam, before you enter eternity.” He says that God will ask us two crucial questions during this “final exam.” What did you do with my Son, Jesus Christ? What did you do with what I gave you? Warren says the first question will determine where you will spend eternity and the second question will determine what you do in eternity. Warren supports this assertion by saying, “The Bible says, ‘Remember, each of us will stand personally before the judgement seat of God…. Yes, each of us will have to give a personal account to God’” (Romans 14:10, 12 (New Living Translation [NLT]). Warren is obviously speculating here. Scripture says nothing about what God will or will not ask us before we enter eternity. If we believe that the sacrifice of Christ covers our sins, what’s there to audit? We appear righteous (sinless) before God because of what Christ did, not what we did. Warren appears to be saying that at the time of our “final exam” it will need to be determined whether we accepted Christ as savior in order to enter eternity and that our “works” will determine our reward and therefore what we do in eternity. The scriptures teach that we are saved by grace through faith in Christ. However, many scriptures show that faith in Christ involves obedience to what Christ taught. In other words, it is not enough to just express faith that Christ’s sacrifice covers our sins. Faith in Christ appears to be characterized by submission and obedience to his will. Loving Christ and behaving according to what He taught appears to define our faith in Him for the remission of sin. Simply said, if there is no obedience, there is no faith and therefore no remission of sin. There are many scriptures that indicate this. The classic passage is James 2:14. James asks, “What good is it, my brothers, if a man claims to have faith but has no deeds? Can faith save him?” Verse 17: “Faith by itself, if not accompanied by action, is dead.” Verse 24: “You see that a person is justified by what he does and not by faith alone.” Verse 26: “As the body without the spirit is dead, so faith without deeds is dead. In Romans 2:6-8, Paul makes this statement: “God will give to each person according to what he has done. To those who by persistence in doing good seek glory, honor and immortality, He will give eternal life. But for those who are self-seeking and who reject the truth and fellow evil, there will be wrath and anger.” The implication is that eternal life is tied to our persistence in doing good works. In 2 Peter the first chapter, Peter lists a number of qualities of character and concludes by saying, “For if you do these things, you will never fail” (2 Peter 1:10). The implication is that if you don’t do certain things you will fail. Expressing faith in Christ involves knowing and believing what He taught. The apostle John wrote, “The man who says, ‘I know him,’ but does not do what he commands is a liar, and the truth is not in him” (1 John 2:4). Such scriptures as these appear to define faith in Christ as doing what he says. Therefore, faith in Christ involves works. If faith in Christ is defined by our response to His teachings, in other words, doing works, are we not saying that salvation is of grace and works? If I must live in a certain way as an expression of my faith in Christ, are not works a dynamic of salvation. Paul says no. Paul writes “For it is by grace you have been saved, through faith--and this not from yourselves, it is the gift of God-- not by works, so that no one can boast. For we are God's workmanship, created in Christ Jesus to do good works, which God prepared in advance for us to do” (Ephesians 2:8-10). Paul is saying in the same breath that works don’t save us and yet we are created in Christ to do good works. What is the answer to this works/grace issue? It is apparent that faith facilitates the granting of salvation by God. Many scriptures show repentance to be a prerequisite to receiving salvation. Repentance means to change. When we express faith in Christ we are essentially saying that we want to change from being a sinner (lawless) to being obedient (righteous). Faith in Christ does not grant us salvation. Faith facilitates salvation. There is a difference. Faith in Christ brings us to want to change our behavior and have the penalty for past bad behavior (sin) removed. God acknowledges our faith and reconciles us to himself by the gracious act of forgiving the penalty of death that our sin incurred. That is why Paul says that it is by grace we are saved through faith. Faith doesn’t save us; God’s grace saves us. God’s grace is made available because of what Christ did on the cross. God removes the death penalty as a favor. That is what the word grace means. It means favor. Once this favor is granted, we appear perfectly righteous before God even though our human behavior will still be less than perfectly righteous. As long as we continue to express faith in Christ, we continue to be the recipient of God’s grace. By definition, however, that faith involves obedience to the teachings of Christ. As the apostle John said, we can’t say we love Christ and not do what he says. What if we sin? What if we fail to obey Christ? We still have human nature and we will sin. John gives the answer: “If we confess our sins, he is faithful and just and will forgive us our sins and purify us from all unrighteousness (1 John 1:9). So is there a “final exam” as Warren writes? When we express faith in Christ, God grants us salvation. Many scriptures show salvation as the passing from death unto life. We already have eternal life abiding within us. God does expect us to continue our faith in Christ, which involves living our lives in response to His teachings. Our behavior, however, has no bearing on our salvation unless we consciously would turn our back on the teachings of Christ and reject His sacrificial gift of dying in our stead. I really don’t believe God is going to ask us what we did with his son Jesus Christ. God will already know the answer to that question. As shown above, Warren uses Romans 14:10 and 12 to support his thesis of a “final exam” before entering eternity. If you read the entire fourteenth chapter of Romans, you will see that Paul is dealing with the issue of the brethren judging each other relative to how their eating habits impact on their relationship with God. He instructs them that they should not be judging each other. He shows that God is the judge of all men and therefore we should not be judging each other. Paul’s primary focus in this passage is to stop the judging of others that was going on. Paul does speak about standing before the judgement seat of Christ in his letter to the Romans and says something very similar in his second letter to the Corinthian Church. “For we must all appear before the judgement seat of Christ that each one may receive what is due him for the things done while in the body, whether good or bad” (2 Cor.5: 10). Is Paul suggesting here that the good or bad we do in life determines our eternity? Is Paul talking about some kind of “final exam” where God is going to review all that we have done in life and on that basis decide our fate? As we saw in Ephesians, Paul is very adamant about salvation being by grace and not of works. Is Paul contradicting himself here? Paul appears to be speaking of different levels of reward based on the quality of what we do to build on the foundation of Jesus Christ. Our works, however, have no bearing on our salvation, only on the level of reward connected with that salvation. Scripture does not reveal the nature of such reward. If there is to be a “final exam,” I see nothing in scripture to suggest being asked the kind of questions that Warren proposes. At death, our destiny as Christians will have already been determined. The destiny for the billions of non-Christians who have lived and died is another question and will be left to another discussion. This is an absolutely irresponsible statement! Not believing in an after life is not justification for wild living. There are both short and long term consequences that follow your actions whether you believe in an after life or not. It would be downright foolhardy for a non-believer to follow Warren’s advice. There are many non-believers that behave ethically because they simply recognize its value in living a less troublesome life. You don’t have to be Christian or ascribe to any religious system to be ethical. There are atheists who live ethical lives. A mature person should not need belief in an after life to motivate them to behave ethically. Warren’s statement on this issue is totally without merit. 1 Corinthians 2:9: However, as it is written: "No eye has seen, no ear has heard, no mind has conceived what God has prepared for those who love him" (NIV). If you read this entire chapter, you will find that Paul is not addressing the subject of eternity but is speaking of how through God’s spirit he is able to give testimony to what Christ has done. In the very next verse (verse 10) Paul says, “but God has revealed it to us by his Spirit. The Spirit searches all things, even the deep things of God.” Paul is saying that through God’s spirit we can know what has been prepared for us. The context of this chapter shows what God has revealed is not the nature of eternity but the purpose of Christ’s coming; a coming that the religious rulers of His day failed to recognize and they therefore crucified Him (verse 8). Warren again uses a scripture incorrectly to support his point. By failing to include the very next verse, Warren gives a false impression as to what Paul is saying. Warren implies that virtually everything we do and everything that happens to us has eternal implications. I don’t believe the scriptures support this. All that we do is not what is important. It’s what Christ did that facilitates our eternity. Our requirement is to place faith in Christ. While such faith presupposes obedience to what Christ taught and therefore involves what we do, we often fall far short in measuring up to the standards that Christ set. That’s why there is grace. Having read this far in Warren’s book, he seems to be placing a great deal of emphasis on what we do impacting our eternity. This could be seen as a movement toward salvation by works. Israel showed the impossibility of such an approach. This is an Old Covenant approach. Christ came to establish the New Covenant where it’s not what we do but what Christ has done that facilitates our eternity. I basically agree with what Warren says here with one major exception. To place all our focus on “heaven” as our true home can result in setting back and doing little to better this world. Christ established His Kingdom on this earth. It may be the Kingdom of heaven but it is a spiritual entity established in the heart of Christians on earth. God ordained that His Kingdom grow on planet earth. God grows the Kingdom through Christians bringing the Kingdom message to all areas of society and civilization. While earth may be a temporary home, it is a home that God is using to grow His Kingdom and therefore very important to God. I find it interesting that Warren speaks of going to heaven when we die in such glowing terms. Yet I would bet that he believes in a future resurrection of the dead. If heaven is our true home and is the place we go at the time of our death, why would we return to this earth via a resurrection of our long decayed body? I will leave that for the reader to contemplate. Warren returns to some of his deterministic ideas, which I do not agree with as covered earlier in this commentary. Many of his statements relative to what makes God smile are speculative. While these may be “feel good” statements about how God reacts to what we do, I would be reluctant to order my life based on speculation as opposed to hard evidence. Warren makes good points in this chapter. The difficulty is that our communication with God is one directional. We audibly talk to God. We verbally in spirit talk to God. God does not audibly talk to us. We may believe that God, in spirit, talks to us, but this is totally a subjective experience and may or may not be objectively valid. We may want to believe in our subjective experience of spiritual communication from God but believing it to be real doesn’t make it so. Many people have claimed that God told them this or that only to discover that in reality this wasn’t the case. It is difficult to determine spiritual communication from God as distinguished from internal human communication. interpreted in many different ways, can we really conclude that the scriptures serve as a valid method of communication from God to man. We need to more critically look at this dimension of communication with God and not just assume that when you read scripture, the mind of God is communicating with you. All the issues of inspiration, inerrancy/infallibility, translation and canonization come into play when we view scripture as God communicating with us. These issues of scriptural inspiration, inerrancy/infallibility, translation and canonization will be addressed in a forth coming essay on this website. We again find Warren seeing God in everything that goes on in our lives. I don’t see the scriptures teaching this. God has set the process of life in motion. Time and chance, cause and effect are the major dynamics of life. I don’t see where God is micromanaging what goes on in our lives. While problems can serve as wake-up calls, it is pure conjecture to claim they come from God. Problems generally came as a result of our mistakes and/or the mistakes of others. These things happen by the billions and billions of times everyday of the week in the lives of Christians and non-Christians throughout the world. Problems occur constantly as the normal flow of human activity, not because God is generating them to wake us up. God may do this on occasion. But unless God reveals in a specific manner that He is at the genesis of my problem, I am not going to assume He is. John 4:21-24: “Jesus declared, ‘Believe me, woman, a time is coming when you will worship the Father neither on this mountain nor in Jerusalem. You Samaritans worship what you do not know; we worship what we do know, for salvation is from the Jews. Yet a time is coming and has now come when the true worshipers will worship the Father in spirit and truth, for they are the kind of worshipers the Father seeks. God is spirit, and his worshipers must worship in spirit and in truth.’"
I believe the truth Christ was referring to here has to do with the covenantal change that was about to occur. The truth Christ is referring to is the worshiping of the Father within the context of the New Covenant that was about to replace the Old Covenant. The apostle John made a rather interesting statement in the first chapter of his Gospel. He said: “For the law was given by Moses, but grace and truth came by Jesus Christ” (John 1:17). What are we to make of this statement? It’s not difficult to understand that grace came by Jesus Christ. The very fact that Christ paid the death penalty in our stead demonstrates His grace bestowed upon us. But why does John contrast the giving of the law by Moses, with truth coming through Jesus Christ? Wasn’t the Law of Moses truth as well? The answer to that question involves the issue of the two covenants in scripture. The Old Covenant that God established through Moses deals with the physical while the New Covenant established through Christ deals with the spiritual. The Old Covenant was temporal in nature. It could not facilitate eternal forgiveness of sin. This system was only a pattern of the real thing. John, therefore, contrasted it with the truth that Christ brought. Christ brought the real thing. The Old Covenant was valid for what it was designed for. It was designed to facilitate a relationship with God based on works. The New Covenant is designed to facilitate a relationship with God based on grace. The whole battle between advocates of the new system versus advocates of the old system involved this question of grace and works relative to a right standing before God. Christ came to reveal the spiritual relationship that we can have with the Godhead through Christ. That relationship involves our resurrection from spiritual death and the presence of the spiritual Kingdom within us. This is what covenantal change brought about and continues to sustain. Our responsibility as Christians is to respond to the grace of Christ by facilitating the righteousness of God in our behavior. This is how we worship God in spirit and in truth. The truth is the spiritual Kingdom residing in us. Since it is spiritual, we worship in spirit. Our entire spiritual focus is on Christ. That focus is revealed in our behavior. If our behavior isn’t righteous, it puts into question our spiritual focus/worship of God. I am not suggesting that every time we sin we lose our spiritual relationship with God. If we have accepted Christ as savior, a spiritual relationship with God has been established. If we sin we have the sacrifice of Christ to cover our sin. John makes this very clear. John points out that we will sin. He also points out that upon confession of sin we will be forgiven. The writer to the Hebrews said this: “If we deliberately keep on sinning after we have received the knowledge of the truth, no sacrifice for sins is left” (Hebrews 10:26). I would surmise from this that confession of sin is vital to our avoidance of being seen as deliberately sinning. If we fail to confess our sins, this is equal to us accepting our sins as OK and therefore continuing to commit them knowing all the while they are sins. I believe that to worship God in spirit and truth is to live according to the standards of the New Covenant, realizing that through Christ we have passed from death unto life and have the spiritual Kingdom of God residing in us. Since the law of love is the law of the Kingdom, it is critical that we express worship of God by behaving according to the requirements of this law. This is my understanding of how we worship God. (See my essay entitled: (WHAT IS THE KINGDOM OF GOD?). On page 102 Warren says, “God-pleasing worship is deeply emotional and deeply doctrinal. We use both our hearts and our heads." I totally agree! That is why I believe that a correct understanding of doctrine, including eschatology, is vital to worship. Our worship is defined by our understanding of God. Our understanding of God is based upon what we know about Him and what He is doing and plans on doing. This is no different than how we relate to other humans. We relate to them based upon what we know about them. If we have false information about someone but don’t know it is false, we will relate to that person based on false information. If we have false understanding about God, we will relate to Him falsely. We should always strive to have increasingly better understanding of God. This is how we come to know God. I think Warren is missing the point here. When someone says “I’ll be there with you in spirit,” it does have meaning and we do know what it means. It is not worthless. It means that they will be thinking about us and were we are and what we are doing. Furthermore, there is increasing empirical evidence that the human spirit can project beyond the body to make its presence felt distant form the body. This, however, is for another discussion. Hebrews 10:5-8, “Therefore, when Christ came into the world, he said: "Sacrifice and offering you did not desire, but a body you prepared for me; with burnt offerings and sin offerings you were not pleased. Then I said, `Here I am--it is written about me in the scroll-- I have come to do your will, O God.'" First he said, "Sacrifices and offerings, burnt offerings and sin offerings you did not desire, nor were you pleased with them" (although the law required them to be made).” Enough said! On page 171/172 Warren says, “our spirits are immortal.” Those who believe in eternal annihilation of the wicked would not agree with that statement. I personally am still wrestling with the issue of what happens to the billions of the unsaved dead. This is an argument from silence. It you are not aware of or cannot feel the release of the Holy Spirit then how can you know it’s happening? Warren uses a quote from 1 Kings 19:12 to support his statement. Lets look at this quote in its broader context. Elijah heard the “gentle whisper.” Whether he heard it in his mind or audibly is not revealed. The scriptures that follow would indicate that what he heard was unmistakably to him the voice of God and he responded accordingly. 1 Kings 19: 14-16. “He replied, ‘I have been very zealous for the LORD God Almighty. The Israelites have rejected your covenant, broken down your altars, and put your prophets to death with the sword. I am the only one left, and now they are trying to kill me too.’ The LORD said to him, "Go back the way you came, and go to the Desert of Damascus. When you get there, anoint Hazael king over Aram. Also, anoint Jehu son of Nimshi king over Israel, and anoint Elisha son of Shaphat from Abel Meholah to succeed you as prophet. Jehu will put to death any who escape the sword of Hazael, and Elisha will put to death any who escape the sword of Jehu. Yet I reserve seven thousand in Israel--all whose knees have not bowed down to Baal and all whose mouths have not kissed him." Here we have a virtual conversation going on between Elijah and God. Elijah was very aware of what was going on. This was a lot more than a nudge. It may have been a “gentle whisper” but it was recognized and resulted in a virtual two-way conversation. Many times Christians get thoughts in their heads that they think come from the Holy Spirit. When they act on these thoughts, they are often disappointed in the results. Look at how much false doctrine has been produced by those who claim to have been led by the Holy Spirit. I choose to be very careful as to what I conclude is from the Holy Spirit, both in myself and in others.